Asia came to us as a very skinny momma kitty, barely eight months old when she had her kittens (think teenage mother!). She was a good mother, her kittens were healthy and happy and have since found a good home. Due to the trauma her poor body went through in giving birth so young while so malnourished, Asia started to go into kidney failure. Thankfully due to some special care and a great veterinarian her kidneys recovered. She has high blood pressure, most likely due to all the stress on her body but that’s been easily managed with pills. 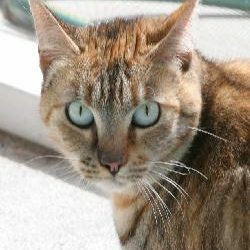 Asia is an exceptionally sweet cat, very affectionate and friendly. After such a hard start in life she’s happy to be inside, being pampered and cared for by her foster mom.